Magic, like a lot of things right now, is broken in the DC Comics universe. The cosmic energies underpinning every facet of existence have been torn asunder by the events of Dark Nights: Metal and more recently No Justice, and the world’s finest heroes are still trying to comprehend how to tape it all back together—and Wonder Woman, in particular, is finding that a very challenging task. After leading the charge of a team of wondrous, mystically inclined heroes as part of the Justice League’s recent weird shakeups, the new Justice League Dark series that began this week—scripted by James Tynion IV, with art by Alvaro Martinez Bueno, Raul Fernandez, and Brad Anderson, and lettering by Rob Leigh—sees Wonder Woman attempting to get the magical band back together. And for good reason, too: Magic has stopped listening to the magi and sorcerers of the DC universe. More distressingly, it’s fighting back, becoming twisted and murdering and consuming the very people who try to conjure it. But Diana is having a bit of a problem on getting the ball rolling on that front. She’s finding magicians like Zatanna horrified by their waning grasp over whatever magic is transforming into, and it strikes at a sort of an existential problem with the way DC Comics in the past have treated “magic” characters. For years, they have been grouped together as outcasts and misfits of metahuman society, put to one side as and pigeonholed as the weird creepy kids. Even the very name of this comic reflects that—these heroes aren’t the real Justice League. They’re the Justice League Dark. They are a subset, an offshoot, always distanced and separate and always have been. Diana has acquired League funding to build herself a gigantic, lavish magical home base in the Halls of Justice that sits empty save for her and a reformed Kirk Langstrom, a.k.a. Man-Bat, while the magical heroes of the world gather to discuss the situation at their usual gathering place, Wintersgate Manor. These characters are deeply insular and secluded, worlds apart from one another in both the spotlight and in terms of understanding each other. See, even here, the magic team is expected to hang out in a cave half a mile away from the rest of the League! So when Diana, one of the Trinity, one of the proper Justice League, shows up at Zatanna’s doorstep (technically the under-new-management Oblivion Bar) to tell them about some grand threat to magic she’s here to help stop, there’s an underlying tension that is rarely considered in a world where the Justice League has grown into an amorphous, vast, and at times segmented entity. Has it always been a grave problem, or is it only an issue now that someone in the big leagues finally noticed it? The magical world turns Diana away as an other—even if, as she goes on to opine to Detective Chimp later in the issue, she literally grew up surrounded by magical on an island of wonder. It might not be an existential question that Justice League Dark can grasp with for too long though. 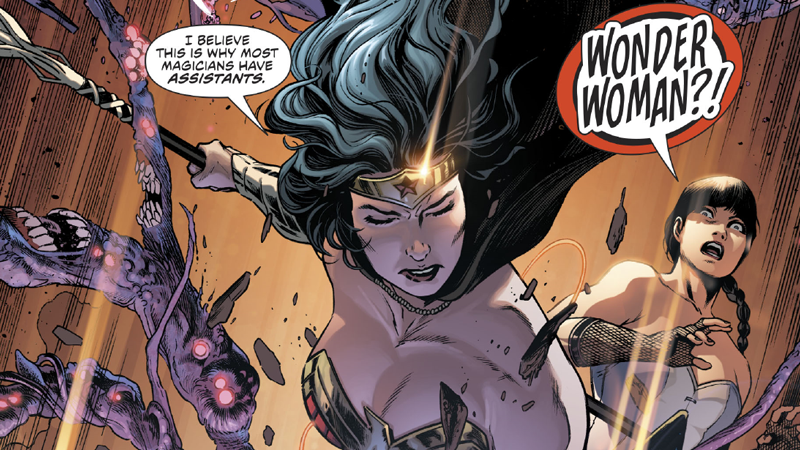 Zatanna, having rebuked Diana earlier despite neither she nor the wider magical community having any idea about how to deal with the very possible end of magic, finally comes to a separate conclusion that Diana is right to be concerned about what’s going on. This brings together the unlikely new line up for the mystical team—Zatanna, Swamp Thing, Wonder Woman, Detective Chimp, and Man-Bat—at the end of the issue. The impending threat of not just the end of magic, but humanity at large, is the crucible that binds them in the immediate future. But beyond that? I’ll be interesting to see if these disparate heroes can keep the band together.